The taxi driver held the horn for 10 seconds and loudly yelled at me in Chinese. I had no idea what he said, but assumed he was having a bad day. As I turned my head away from the crazy taxi driver, I almost got hit by a motorbike on my right side. TWICE, in less than 7 seconds, I came closer to being run over by a vehicle than I had in my previous 34 years on earth. Welcome to Shanghai. Where I quickly learned that the green signal for pedestrians to cross the street, simply means you have permission to risk your life. 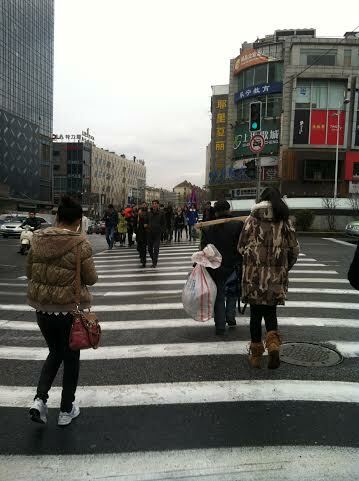 No joke: crossing the street in Shanghai is a real life game of Frogger. In the United States, I/we often dare vehicles to hit us. We assume vehicles will stop if we are in the crosswalk. Here’s a tip: don’t do that in Shanghai. In Shanghai, your head should be on a swivel. You will need to dodge bicyclists carrying 50+ pounds of produce, buses, cars, motorcycles, motorbikes, and your fellow pedestrians attempting to cross the street. The first two weeks in Shanghai have been an eye opening experience for me. 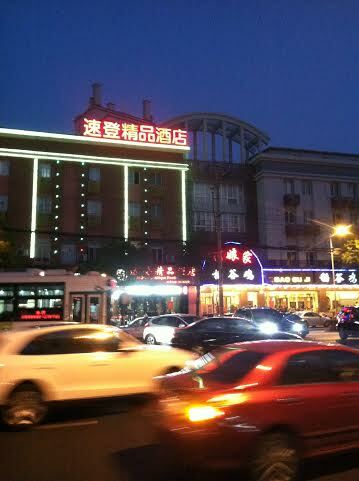 I am located in the Yangpu District of Shanghai. Judging by the looks on the locals faces when they see me, there are not many westerners in this part of Yangpu. There’s the five year old child who stopped in his tracks when he saw me, his eyes popped out of his head. He’s not alone. There’s the elderly lady who stopped talking, pointed and starred at me, craning her neck as I walked past her and her group of friends. The two teenagers who laughed at me as I attempted to order food from their street food stand. There is very little English – spoken or written – (why should there be? I’m in China) so communication, which I took for granted in the US, is a challenge. But I’ve adapted, and I’m thankful that the ability to adapt is a strength I posses. Things won’t always be easy. This trip has reaffirmed, for me, the importance of being able to adapt – both in business and in life. I’m really good at Charades – I successfully acted out that I need to find a place to do my laundry. I successfully ordered eggs after I pretended to crack an egg. Also, a smile is universal. People are willing to help when they are greeted by a smile. The business lessons have been plentiful as well. Hopefully, I will improve at crossing the street so I can write about my business insights. Shanghai is electric. I highly recommend a visit if you ever get a chance – just be sure to look both ways, multiple times, when you cross the street. Customer Experience: It’s Okay to Nurture Family Members Too! A $5.00 Gift Card & An Apology – Is This a Memorable Customer Experience?